This month Priya Suresh of Priya's Versatile Recipes challenged the Northern Group of SNC team to make Goli Bajje. 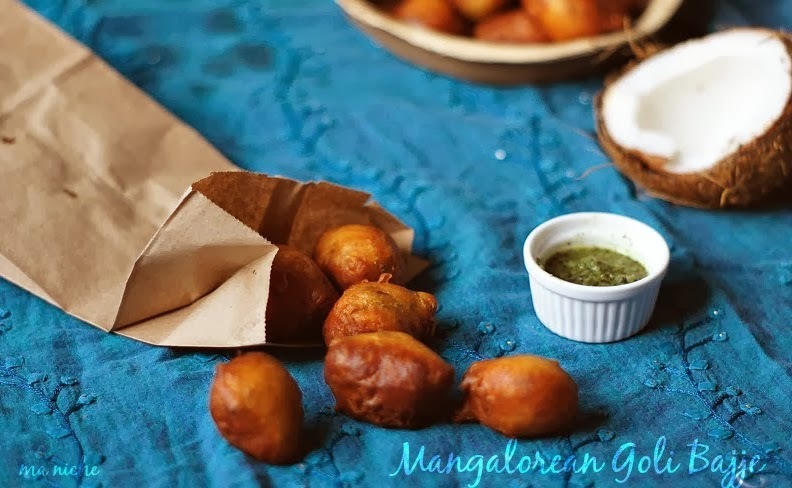 These deep-fried snacks are a specialty of Mangalore in Southern Karnataka. Unlike most other deep-fried snacks from South India, these are not made out of urad dhal. So no soaking or grinding is required for them. Traditionally these bajjes are prepared from an overnight-fermented-batter. However I did not plan them well in advance so ended up making them with a batter that had rested only for an hour. Though we enjoyed them as they were, I am pretty sure that overnight fermentation would have accentuated the flavors of these Bajjes. 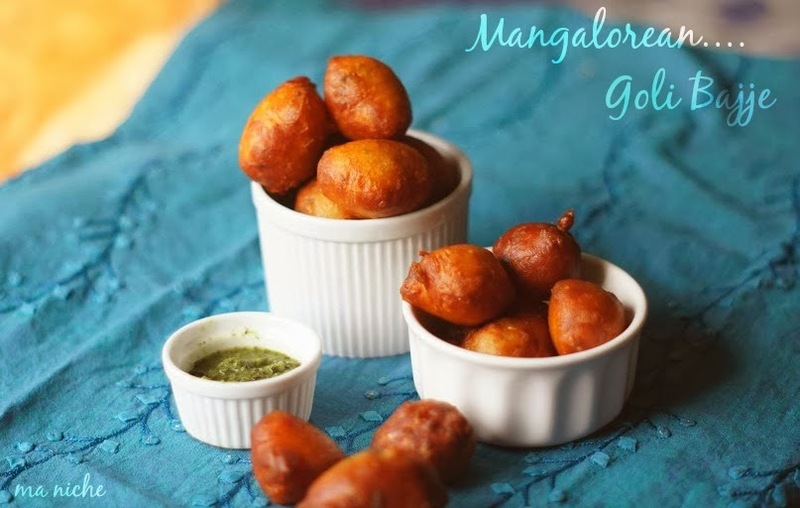 Typically Mangaloreans enjoy Goli Bajjes with tea. We however had some of it as a side for lunch with Gujrati Kadhi and Aloo-methi and thought they complimented the meal very well. Put the flours, yogurt, water, sugar, baking soda and salt in a bowl and mix well. The batter should not be very thick or runny. The consistency should be such that it falls slowly from the whisk or hand beater. Cover the batter with a foil and let it rest in a warm corner of the kitchen overnight. In case you do not have enough time in hand, preheat the oven to 170 degrees F, then switching off the heat, put the bowl of batter in the warm oven, cover it with a sheet if aluminum foil and let it rest for at least one hour. When you are ready to cook, stir in the coriander, cumin seeds, ginger and green chillies to the batter. Mix well, then stir in the coconut pieces. Now that the batter is ready, heat enough oil in a saucepan for deep-frying. Put a drop of the batter in the oil. 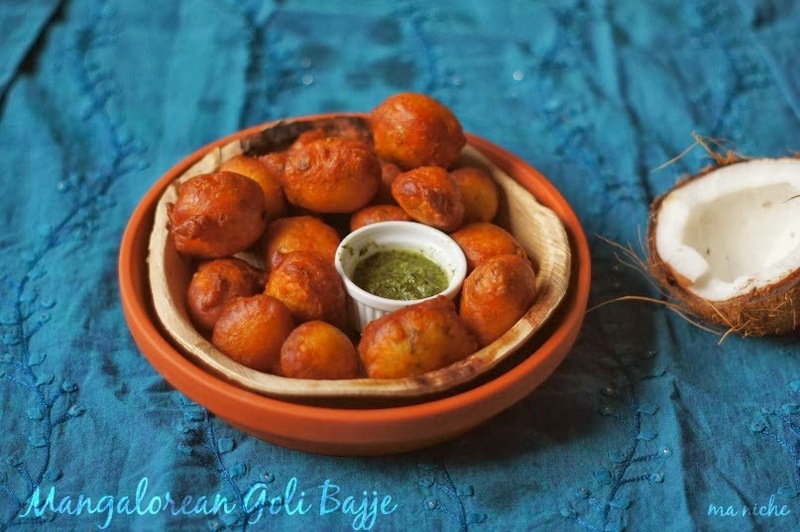 If it floats up right away without changing color, then the oil is hot enough and you can start to deep-fry the Goli Bajje. Drop about a tablespoon of the batter in the hot oil and repeat the process a few times taking care not to over-crowd the saucepan. Turning the bajjes fry them on both sides until they look golden brown. Transfer them to paper towels to drain off the extra oil, then serve them hot with coconut chutney or sauce of your choice. Thanks to Priya Suresh of Priya's Versatile Recipes and Divya Pramil of You Too Can Cook for the challenge and the SNC event. This is certainly one of the dishes that'll keep appearing in our menu often... but next time I'll plan in advance to savor the deliciousness of these Bajjes. How golden brown and delicious! perfectly made goli bhaje :) looks super tempting !! Looks delicious , glad that I found recipe from my native town Mangalore on foodgwaker, thanks for sharing this recipe. I've got few mangalorean delicacy's on my blog except this.